Are you looking for deep healing and overall balance in your life? Then you need to experience the power of this Crystal Bed Therapy! This Crystal Bed has seven extremely clear and highly polished Vogel-style quartz crystals suspended above you and aligned to each of your main chakras as you lie down surrounded by relaxing music and the energy of other crystals in the room. 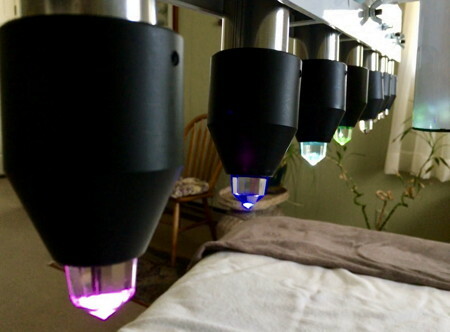 Colored lights matching the chakra rainbow spectrum radiate energy through the crystals to each of your energy centers, lighting on and off in rhythmic motion to cleanse, balance, and align all the layers of your soul. Once you set an intention for the session (on any level), you simply relax and rest, with your eyes covered, bathing in this high vibrational energy. I had experienced wonderful results with this therapy both before and while I visited the Casa de Dom Inácio in Abadiânia, Brazil. 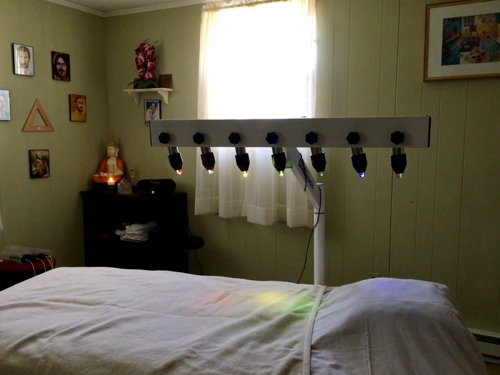 So I decided to ask permission to bring a Crystal Bed to the Asheville area and offer Crystal Bed Therapy for rejuvenation and chakra healing, to support the spiritual, mental, emotional, and physical well being and transformation of my local clients. These are very challenging times, and we all need much support, from all possible angles! You need permission from the spiritual entities in Abadiânia, which is itself a vortex of spiritual energy built on a pure quartz dome, because they actually come along with it! In addition to the healing power of both crystal and color therapy, these spirit guides and multidimensional doctors use this as a portal to provide their support as you receive this Crystal Bed Therapy, helping you open your heart to love and deeper healing. After having done this therapy myself many times, observing and talking to others about it, I can tell you that each session is different and every person responds differently to it as well. You may simply fall asleep, which is a great thing to do, since healing happens when you’re relaxed and more open. You may go into a deep meditative or blissful state, feeling touched by the Divine. You may receive insight, visions, messages, or perceive the entities working on you. You may have all sorts of bodily sensations or involuntary movements (kriyas) in the areas where healing is happening. Or you may bring forth thoughts, memories, or emotions, only to see them fade away and resolve as you release their negative, stagnant energy and allow greater self-love. The possibilities are endless, since the healing process provided by these high spirits is profound and clears disruptions on a spiritual level, which is where any imbalance really begins. In other words, it goes to the root cause of your issues in the causal body of the soul (your subconscious), addressing negative imprints of both this and previous lifetimes. Each session is unique, but one thing is certain: the more receptive and grateful you are, the deeper and more blissful your healing will become. Feeling more energy, clarity and focus. Releasing fears, doubts and pain that had haunted them for years. Feeling an increased sense of peace, well-being and faith. Gaining a spiritual understanding of themselves and others. Resolving health issues and experiencing less stress in challenging situations. Seeing past lives to understand present situations. Feeling more relaxed, connected and grounded to the Earth and the Universe. Perceiving their life path and purpose clearly, as well as the evolution of Mother Earth. Receiving insights into the cause of disease and how to better support their healing process. Are You Ready to Feel Clearer, Healthier & More At Peace? Contact Me to Schedule Your Sessions Now! “Each crystal bed session begins in an atmosphere of tranquility. Just entering the room, any pressure dissipates and all the chaos and troubles of the day are lifted. But each one is different! I have witnessed the nature of my ego, been guided with outer-worldly visualizations of cosmic space and time, gone into deep trance-like meditative states and caught glimpses of my soul. I have been doing weekly sessions for a while and have had life changing experiences. Since the second session I began feeling lighter, lifting darker heavier energy of the past. After a deeply meditative session I felt the opposite of guilt: pure innocence! I felt connected to my true nature and have begun to really understand the nature of the soul. This shift was incredible, such a lifting feeling, like an innocent being with nothing to prove—free, light, grateful, hopeful, and connected. “I am so deeply grateful for the guidance Yol has provided as I pursue my dream of being a soul based entrepreneur. Her generous, compassionate support and intuitive insight have been invaluable because establishing my own business has also been a personal healing journey. One that is empowering me to use my unique gifts to heal others and to prosper by doing so. Set a clear intention for your session, on any level—physical, emotional, spiritual, financial, etc. Wear white or light colored clothes and avoid dark colors (including underwear). This helps the entities see through you and zoom into your main disruptive patterns or blockages of energy. Avoid intoxicants or stimulants before your session (i.e. caffeine, alcohol, recreational drugs). The cleaner your body, the deeper energy can penetrate. Create a sacred space within you during each session, with a pure mind and body. Turn off your cell phone right before, during, and after the session, to stay focused, present, and relaxed. Drink plenty of water throughout the day. You will get a little bit of blessed/energized crystal water (from Abadiânia) to drink right after your session, but it’s very important to stay hydrated to flush any toxins that may have been released. Rest and keep calm for the remaining of the day, and as much as possible in the following days. No heavy physical activity, computer, internet, TV, or heated conversations, if possible. Try to keep to yourself to fully absorb the experience and be gentle with yourself as it all sinks in. Avoid sharing it with those who don’t understand or don’t believe in energy healing. Nurturing self-love and meditative states is how you open, activate, energize, and balance your chakras—to keep your mind and body healthy, and promote spiritual growth. This Crystal Bed Therapy will support you with this, along with regular Spiritual Counseling & Coaching. How many sessions do I need to see the change I want? Each person is different and has different issues and needs, so it’s a very individualized process. Plus, of course, it’s up to you how deep you want to go with your healing. Obviously, the more sessions you do the stronger your connection to these energies becomes. Can you do any other type of healing during a session? No, the Crystal Bed Therapy is powerful on its own, and I can’t get in the way of the entities working on you. But I’d encourage you to combine these sessions with a Spiritual Counseling / Coaching program to gain insights and tools, and a deeper understanding of yourself. Who are these spirit guides or ‘entities’ you talk about? Spirits are all around us, but we can’t usually perceive them with the physical eyes, only with the spiritual senses. Although there are different spiritualist (or spiritist) traditions in Brazil, hundreds of spirits concentrate regularly in the Casa de Dom Inácio, in Abadiánia, and also use these crystal beds as a portal for healing around the world. Many were doctors, surgeons, or saints during their last incarnation and decided to remain in a closer realm to continue helping humanity selflessly without the restrictions of a physical body. Some of the main well-known figures are: Saint Ignatius of Loyola, Dr. Augusto Almeida, Dr. Jose Valdivino, Dr. Oswaldo Cruz, Saint Rita of Cassia, Dr. Bezerra de Menezes, Saint Therese of Lisieux, and many more. Can you do this therapy long distance? No, this therapy can only be offered in person. You can check my Distant Energy Healing, which can be done with a recent photograph, and is also an effective yet gentle, subtle process for you (but much more involved and intense for me). The word Chakra means “wheel” in Sanskrit. 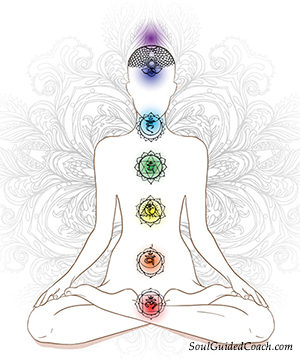 Chakras are vortexes of energy that regulate physical, emotional, mental, and spiritual functions. These energy centers are part of the network through which your body, mind, and spirit interact as a whole, integrated system. There are seven major chakras and many minor chakras all over the body that form an energetic grid connecting you to the flow of life and to higher realms of existence as well. The seven major chakras have individual characteristics and functions, and correspond to specific aspects of Consciousness. Each chakra relates to one of the various glands of the endocrine system, as well as the different systems and organs in the body. They’re doorways of Consciousness through which the spiritual creative energy within you flows into physical expression. The energy from your thoughts, emotions and mental attitude runs through the chakras and is distributed through your cells, tissues and organs. Self-awareness can bring insight into how you affect your mental and physical health—for better or for worse—and how to restore balance. But you need guidance and support, as well as extra energy and clarity to heal the past and keep growing, especially in these dense and dark times of transitioning into new cosmic and planetary cycles—when your personal transformation is the key to transforming the world and healing the planet. Disclaimer: The information provided on this site is for educational purposes only. Energy or spiritual healing is intended to work with your current medical regimen. Do not stop medical attention or medications. Consult your health care practitioner if you have any health concerns.